UPDATE March 2014: In hard copy form my "Can You Hear It Ring?" instrumental guitar CD is now officially out of print. However it is available on ITUNES! Please also check out the mini REVIEWS at the bottom of this page. 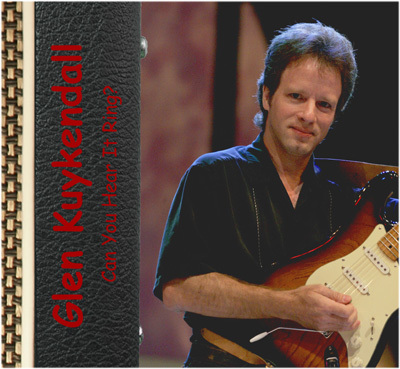 Glen Kuykendall's 1st instrumental guitar CD "Can You Hear It Ring?". 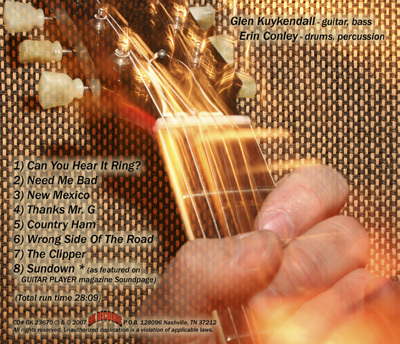 Glen is a Nashville based professional studio and live performer regularly performing on the GRAND OLE OPRY, on the road with several professional touring artists, and featured on this CD with drummer extraordinaire Erin Conley. Glen is known on the web on several tech forums under the nick name of "Geetarpicker", and has finally released a CD of original instrumental material in the ROCK, BLUES, and COUNTRY vein. Though he's from Nashville, Glen's style is more heavy and hard rock based than one would typically expect coming from Music City. The last track on the CD was released several years ago on a GUITAR PLAYER magazine Soundpage (never before on CD however) and a quote from the magazine article reads: "a profoundly musical rocker with a too-good-to-be-true tone." The other 7 tracks on the CD are totally new and have never been released. 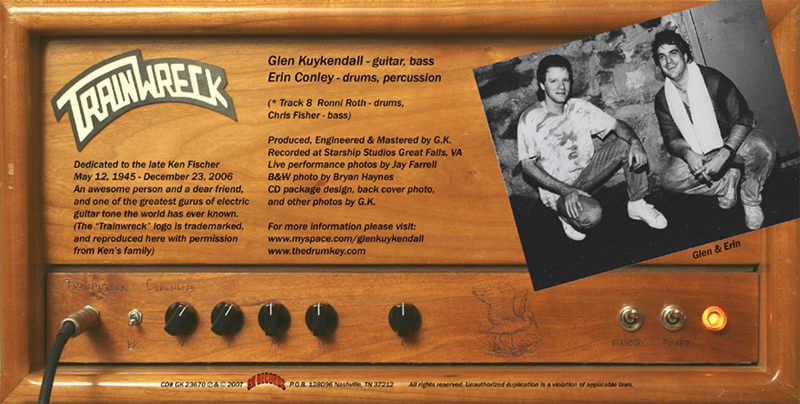 The CD is dedicated to the late Ken Fischer of Trainwreck guitar amplifier fame. Ken’s amps these days have practically reached Holy Grail status, though less than a handful of commercial recordings exist that feature his famous and very rare amps. That said this CD features "real" Trainwreck amps on all the tunes except for one acoustic track, all recorded the way Ken probably would have liked with NO guitar pedals inline period. This CD is most likely the 1st and only commercial "instrumental" release featuring these rare amplifiers thoughout. The CD has 8 songs, and the total run time is 28:09. GUITAR 9 CD review: "For his first solo release, Nashville guitarist Glen Kuykendall put together eight all instrumental rock/blues and country numbers which showcase his great chops and liquid tone. Tasty from start to finish, the EP-length Can You Hear It Ring? will energize fans of buttery solos, Vaughan-like riffage, tube-melting overdriven Strats and wicked phrasing. The last track on the CD, "Sundown" was featured on Guitar Player magazine's Soundpage in 1990 - interestingly, the track was a studio out take, recorded when the record button was accidentally pressed during a session. Never short for hyperbole, GP editors wrote "a profoundly musical rocker with a too-good-to-be-true tone." Would that your own accidents were this happy - highly recommended. 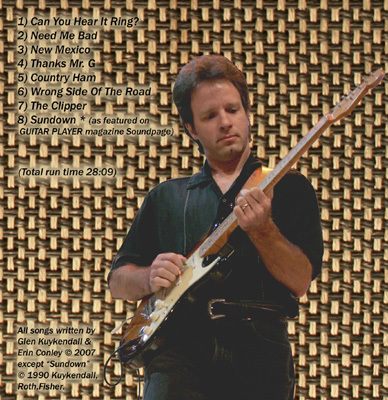 Instrumental Guitar (Electric/Rock/Country), total running time, 28:09"
100s of comments from EBAY buyers of Glen Kuykendall’s “Can You Hear It Ring?” instrumental guitar CD. Thanks folks!!! !